Sound interesting to you too? I sat down and talked to Craig Wear, Founder and CEO of Q3 Advisors LLC – an SEC Registered RIA to learn more about Active 401k and recorded the interview. To listen to the iTunes podcast episode instead, click here. Hey – Sharon here. Today we’re talking about a platform called Active 401k. They offer an online automated account advice solution that makes the asset allocation and quarterly rebalancing recommendations for you. It sounds really interesting. It sounds like a great way to address participants that fail to pay attention or show up for the one on one meetings. It sounds like it’s a great solution to outsourcing the participant advice solution and also sounds like a way for you to offer a valuable service. You may not be able or willing to offer to differentiate yourself and offer something that other people aren’t offering. Plus if you’re not even a 401k adviser, it offers you a chance to get to know participants in the plan. And by offering this solution to plan sponsors, it allows you to get to know the participants. And it seems like a way for you to bring in additional revenue based on their pricing structure and your flexibility in what you charge, how you charge, and how much you charge. If that sounds interesting to you, like it did to me, you’re going to love this segment. I asked Craig Wear to talk with me today about this platform that he’s developed. And so I’ll hand it over to Craig. My name is Craig Wear and I’m the founder and CEO and chief cook and bottle washer of Q3 Advisors LLC. It’s an SEC Registered RIA. And one of the services and products that we offer is a non-discretionary investment advice service called Active 401k. Great. For advisors that have never heard of Active 401k. That’s what this entire segment is about. But how would you explain it to somebody that’s just listening to this for the first time? Active 401k was kind of born out of my experience when I owned my own shop and doing fee based financial planning work. It’s a tool that I developed over that time frame. And after I sold that practice and decided that I wanted to be something else when I grew up, we just took the, took the concept and made it scalable to where any adviser anywhere in the country could use it. It’s non-discretionary investment. I’ll use the word education because that fits with your ERISA folks. It’s a non-discretionary investment education slash allocation service that can be delivered directly to any plan participant with any defined contribution plan and any is about a 98% factor. There’s a few things we can’t really do, but we haven’t found very many of them. So if they have a 403(b), a 457 401(k) or whatever else is out there, we can provide investment allocation advice directly to the plan participant. The advisor doesn’t have to get involved with that. On the front end? We market exclusively through financial advisors, which is one of the big differences between what we do and what some of the bigger, bigger outfits out there do. We are not interested in getting their clients, now or later. The heart of a financial advisor went into this to say, how do we keep this within the brotherhood and the sisterhood, so to speak? How do we make a product available that plan advisors or wealth managers can use to give their clients and participants a better outcome for retirement. So typically the plan advisor or a wealth management firm that wants to grow their business will subscribe to the service. The other is maybe they want to not just grow their business, but they want to offload some of the burden that they’re having to bear of some of the responsibilities that they don’t, that they don’t want to on the back end. Any plan participant in any defined contribution is really fair game and can be marketed to very easily. Okay. You mentioned that that pretty much any type of plan, this service would work for. Is there any types of plans that it wouldn’t be appropriate or work for? I wouldn’t want to put it in an IRA because the goal is to capture assets so that one day if it’s, if it’s right for the client, that those assets can move out of a plan that has limited investment options and move into whatever the firm happens to be doing in their own secret sauce of their portfolio management work. But from a, just from a definition standpoint, any, any type of qualified plan that has a defined list of investment options, we can work with, we can evaluate it, push out investment recommendations and we push out investment recommendations every quarter to the, directly to the plan participant. It’s all right. I gotta rake. We’ll work it out. Okay. 😉 Well, one of the questions I’m thinking is do you have to have access to participants account to know what their allocation needs or is it strictly based on the fund lineup and the information you get from the participant? Yeah, that’s exactly the latter. We don’t need… All we need to know is what’s the plan line up and we get information from a variety of sources. If there a plan advisor, they’ll send it to us, we’ll curate that and it’ll be in our database within a day or two. We even have some technology developed on our side, the wealth management side of the business. If the client doesn’t have, if it’s a particular type of client that’s probably not going to be easy to get information from. We have something called a plan builder technology built in where the advisor or an admin can just take the client statement and enter the ticker symbol symbols and it’s done right then instantly. So we make it pretty easy for people to come onboard and enter with, enter their lineup. And if it’s a little bit more difficult, if it’s CIT is or SMAs that are in the account, then they forward them and, and we’ve got a team that just figure out how we, how we assign those to asset categories to go with the different models that we use. Okay. How do you determine the risk tolerance for the participants? That’s a good question. We started off using some of the name brand risk tolerance programs that are out there and found that those were equally as repelling to some advisors as they were attracted to other advisors. And so we just decided not to put a dog in that hunt. And so we use the Grable Lytton risk tolerance survey, which is one that’s been around for a long, long time. It’s independently validated. It’s had a lot of academic background to it. It’s 13 questions and as the client comes in, we’ve got about a three minute sign up process that the client goes through, whether they’re on a desktop or a mobile application. And part of that, most of that three minutes is in just answering those 13 questions that Grable Lytton came up with. And when they’re finished, they’ve got a risk tolerance and we give them the ability to change that over time if they want to which is an important compliance element I’m told by some of the compliance officers out there, but we come up with it and then we assign them to a portfolio strategy and they say that’s what they want or they don’t want and we just kind of go from there. Interesting. Sounds easy. How do you determine the portfolio strategy and what portfolio models do you use? Well, currently we have one portfolio model. We are really close to announcing a second one. I’ll use as a little bit of a teaser there for those to stay tuned. Right now we use what we call a dynamic risk management model, which was born out of the resources that I used the last decade of managing our clients own money. It’s a quantitative model. It’s not based on what Craig thinks or what direction I think the wind’s going to go. It’s all based on quantitative model. It’s more of a momentum based model. So we’re watching of a variety of sectors and I’ll go as deep as you want me to on that, but it’s … we make changes every quarter and we determine two different levels. One is how much market exposure should they have. And then once we know what the market exposure is, then we’d go pick what the best performing funds are within the lineup options that they have available to them. And the longer term returns have been great. For those that are going to listen in to this, that are kind of getting geeked out by the numbers and portfolio stuff, they’ll like the numbers that they see. The second model, we’re bringing in is much more traditional in its approach. So it’s probably a whole lot more like what they’re accustomed to using. We started with what I was familiar with, what I had had a lot of success with, with my own clients, and then adapted it to what we do. It’s a Dalbar validated model. It’s QDIA compliant. So it’s got some hair on it. It’s good stuff. Okay. I’d be interested to learn more when that comes out. You’ve mentioned “we” a lot and again, I heard you mentioned selling your practice and starting this new firm to offer this service. One of the things I’ve found in the past with advisors being nervous when they’re outsourcing their services to another registered firm thinking that there might be some competition involved. I know we had taught a plan management fiduciary training program and a lot of advisors wouldn’t engage us because we also had an RIA where we serviced 401k plans even though it was a completely separate training company. Do you, do you hear that concern and how do you address that or is it valid concern? That’s a good question. And I guess there were times over my career that I probably had that same question. And then I just came to realization there’s, there’s so much business out there for everybody that, um, but we don’t want to add to the competition on purpose, right? We don’t want to walk into a situation that we know that somebody is like the fox in the hen house. Right? And so if you go look at our ADV, it doesn’t even give us the ability to take in clients to manage their money. I don’t know what better proof I can give then I’m going to be committing a federal offense if I compete with them. No, not at all. We do test different marketing strategies that allow us to charge some sort of a one time fee for advice on certain elements. But those are all beta test marketing programs that are designed to generate, if we’re successful with our plan of those beta tests, are designed to generate highly qualified leads to be able to feed to our advisor network. Those are beta right now. I had good success with them in my own firm when I had it. But we’re, we got a little bit different slant because of the way we’re approaching it. But I say that really just to mention that if they go read the ADV and they see that, oh well you can charge a fee for doing this. Full disclosure, those are marketing things. We’re trying to actually help them by, creating, solving one of the biggest problems most firms have, which is where do I get my next client? Yeah. Well you’ve talked about using it as a, as a marketing tool. What kind of advice would you give advisors that are looking at this for that purpose? Obviously there’s a huge benefit to being able to help participants, but as you alluded to, being able to differentiate their value and offer something that their competition isn’t offering, is a value. So how would you address that or discuss that with advisors? Well, the last six years of my practice, we grew from $12 million to $130 million under management, which is not a big firm by a lot of people that are going to listen to standards, but to go from 12 to 130 million, for me it was a lot of business, right? We had $32 million of assets the last year I was in of new assets in my last year in practice. And I know there are guys out there and ladies that do that in a month. But the point is if you want to grow, you’ve got to find a tool that will help you to grow. And what the Active 401k service did for me when I used it with just my little band of merry men clients, is it gave me not just a differentiation, but it gave me a tool that allowed the net to be so much broader than only dealing with the 5% of any population that are ready to buy today. It gave me that tool that I could stick my, uh, I could, I could wrap my arms around that 85% of the market that are going to buy some type of financial planning advice in the next period of time. But what most advisors are really poor at, I’ve discovered is marketing. And so they do something to generate a dollar immediately and that, and whatever it did as a return, they say, okay, I made money on that dinner seminar, but they never do anything to hold on to all the people that they spent money on to get to the seminar, but they didn’t come in or they didn’t choose to do anything in that one little example. That’s a way to hold on… this service is a way I used to hold on to those. I also had a talk radio show for five years in the Houston market, and we talked about this on the radio and people were a part of our network. We’ve got a young man out in California that’s using our service. He’s put a 125 people into his Active 401k service over the last year, totaling close to $75 million of assets. And he had never met a single one of them prior to them coming on board, the Active 401k service. So now he has this database to mine and relationships to develop that if he does it right and he doesn’t rush into the hen house waving his arms and screaming at them, he’ll, he’ll get new business out of that for many years to come. So it’s, it’s a phenomenal marketing tool and it really surprised me when I was using it, that it was that powerful because it’s so simple. It’s like, well how could it ever do that? But I think the key to it is that it actually lowers the bar of entry. Somebody doesn’t have to come in and go through the whole rigmarole. They don’t have to bring all their tax returns and all of their statements and all their life insurance and all their wills. They just need to subscribe to a service that most financial advisors that are on our service are charging $19 a month for. And if you can get, if you can get a new prospect, I paid over $800 per new qualified prospect the last several years I was in practice. So if I can get a new guy in the door and he’s paying me $250 bucks a year and he’s qualified and I don’t have to spend any time with him until he’s ready to do something, uh, it just worked. I think it works out good if you want to grow your practice, if you want to find more relationships, qualify them as they come on board, not spend a whole lot of time with them. It’s what it did for me, Sharon, and it’s why it’s one of the emphasis this is that I’ve taken it out to the advisor community to say, Hey, I don’t know anybody better than to provide the service. Then a good advisor because the client already trusts them and there’s 94 million of them out there with 401k accounts that for the most part they’re getting no advice at all on how to manage the investment lineup inside their plan. Thinking about what you said, it sounds like it would be a fantastic tool or service for the advisor that’s not a fiduciary at the plan level, offering 3(21) services to the plan sponsor because at some point if they mine and build relationships with participants using this tool, there’s a potential conflict of interest in going after that rollover business. Right. You’re more versed in those regs than I am. I know they exist. I know they need to have some really good reasons of why they do it when they do it. But for everybody else who doesn’t do the 3(21), they’re not going to wear any more responsibility by offering our service than they were the moment before they offered the service. We wear the fiduciary responsibility on the portfolios and in the advice that we offer in that context to the client. The firm that subscribes to our service doesn’t wear that responsibility. Gotcha. Now in talking about fees and how much you would charge participants in month, what is the minimum fee to charge to offer this service? To the advisor or to the client? So we have a $2,900 annual fee for the firm to access the technology. If the firm in a location has got three advisors, then it’s one cost of $2,900 bucks. If they have got a multiple offices, we just need to talk to him to see how they’re structured to see what’s fair for everybody involved. But let’s just say it’s the average financial planning firm that’s got a solo or maybe two guys or a man and a woman doing a practice, they’re going to pay $2900 bucks a year for the service and then they’re going to pay $2 per month per participant. Now the neat part, Sharon though is that we actually, one of our differentiating elements that we’ve offered on our side is we actually have the payment gateways already set up for those firms where they can charge their client. So we got the payment gateway set up and when the client walks in the door, the advisor has already decided what he’s going to charge them and it can be any number he wants to pick. Most of the firms charge $19 a month or $250 a year or something like that. Others offer it for free to their better clients and everywhere in between is what we see around the country. Well if they charge them $19 a month, all they need are 15 paying clients to break even on the service. Part of what I tried to create this, how do I get some of the things off of my expense statement and onto the revenue creating part of the balance sheet. I mean, yeah, well we’ll call it whatever it is, the revenue statement, right? 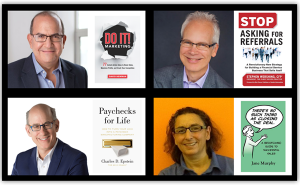 We take what mostly what most of us do in the advisory world is we spend a lot of money on marketing, hoping it makes some money and this is certainly marketing, but from day one you have a way to know that you don’t have to wait for the timing to be right. You’re going to at least be able to monetize that, that’s the real benefit to the services, not in the fees that you charge the client. It’s just our way of making that expense a non-expense. Just turning it into a revenue neutral situation with just a little bit of elbow grease. Yeah, no, it sounds great. It sounds like you’ve put a lot of thought into that and made it a kind of a no brainer on the, on the expense side. To clarify, it’s $2,900 for the advisor, regardless of how many plans they have, how many plans they put in there? So, um, I should have gone further on the pricing. The $2,900 is for the access to the technology. And then there’s actually it branches into two different pricing strategies at the plan level. Okay. If it’s not a plan, if it’s just a wealth management client, they’re going to pay $2 per month. The firm is going to pay us $2 per month. If they have a plan, the deal becomes even better. And it becomes a little different than what I envisioned when I started this, only because I, in 32 years of practice, I’ve never installed a single 401k and we’re, and we’re finding the 401k plan advisors are liking this equally as much as the wealth advisory space. So we’ve come up with a special pricing for them. They’re going to pay $50 cents per month per participant in the plan, annualize it. So if there’s a hundred people in the plan, they’re going to pay $600 for the whole year. And what most plan advisors do is mark that up to some reasonable number and include in the education expense item on their proposal to the company. So they’ll monetize it immediately also. Right. And the price a lot lower for them. Sounds like another good deal. Well, we had a lot of input from a lot of plan advisors trying to figure out what, you know, what makes this a no brainer for the plan advisor, what makes this so simple and so cost effective that the only excuse is I just don’t want to do that. Yeah. It sounds like you’ve come up with really good conclusion or, or, um, outcomes for that in order to reach that conclusion. Now I know that that there is a website that we could send folks do so they can get more information, they can schedule a demo, um, and, and contact you and go from there. But is there anything else that maybe I didn’t ask you that you want advisors to know about this? You know, I think, I think we’ve covered really most everything. I just, I just really want to emphasize that, that we, we do offer investment advice and very customized specific allocation recommendations to any plan participant, whether you are the plan advisor or whether they are a wealth management client. But this is more of a marketing tool … as much of a marketing tool than it is an investment management tool because it’s designed to give the wealth manager access to funds he didn’t for a longer period of time. If he also is a hybrid where he does some 401k’s, it’s a backdoor entry into a lot of local plans from the wealth management side that he can go in and prospect because now he knows a lot about that plan and has a person or two inside. It’s a great referral base building. We have the technology that we have, promo codes that they can go and offer to a guy that works at a big company and offer him this “special VIP treatment” that you can’t do it with everybody (wink, wink) but he can go give this to about 10 people that he works with and I’ll be darned if they don’t do that. And so the people that work with your good client all of a sudden subscribe to the service and they show up on the advisor side of the dashboard and you got somebody new to go connect with them and talk with on the plan advisor side, there’s just not a lot of people doing what we do in that space. And we’re finding that the plan advisors really love it from a differentiation standpoint. And I think some of that we did cover, but I just want to, if we’re going to wrap it up, I want them to remember that don’t get too much into the details of the investment side because it’s a marketing tool as much as an investment tool. And if they are, you know, we know statistically that only 7% of plan participants will make any kind of change to their investment allocation over their lifetime, well over this year… And we know that about 90% of the value of that account at retirement is going to be because of making good allocation choices and we know because they don’t make those good allocation choices, the average plan participant gets 3.6% average rate of return. So however we get there, if all we can do together as a group is help them to increase that rate of return without taking a tremendous amount of risk and to insulate them from the emotion of the markets, then I think all of us have done a good job and maybe everybody’s made a little bit more, more money along the way. Fantastic. Thank you so much Craig. I appreciate you taking the time to share this. I know a lot of advisors are really going to appreciate I’m learning about this and and hopefully will reach out. I’ll post a link below the video and in the in the comment section as well. So thanks again. Really appreciate it. Oh Man. Thank you. I appreciate the opportunity to be with you today. Have a great one. Don’t miss out on all the resources we’ll be reviewing in the future. Subscribe via YouTube to get access to future episodes and don’t forget to give the video a thumbs up. It helps more people find our channel. 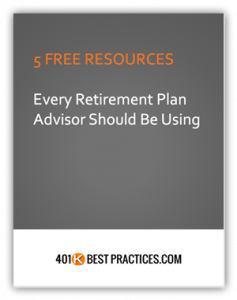 Do you have a product or service that 401k advisors should know about? Contact me and let me know about it!